Definition at line 48 of file LegacyPassManager.h. Definition at line 1882 of file LegacyPassManager.cpp. Definition at line 1888 of file LegacyPassManager.cpp. Definition at line 1892 of file LegacyPassManager.cpp. Referenced by llvm::LTOCodeGenerator::compileOptimized(), llvm::lintModule(), and llvm::LTOCodeGenerator::optimize(). 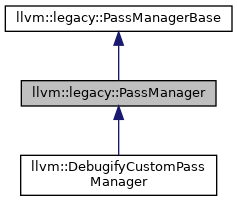 Definition at line 1898 of file LegacyPassManager.cpp. Referenced by codegen(), llvm::LTOCodeGenerator::compileOptimized(), llvm::lintModule(), LLVMTargetMachineEmit(), llvm::orc::SimpleCompiler::operator()(), and llvm::LTOCodeGenerator::optimize().